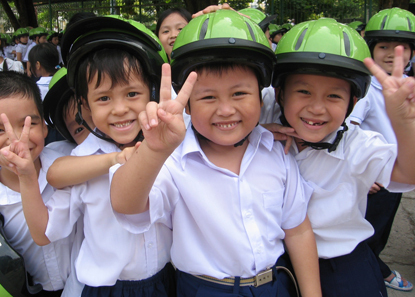 Following several intensive campaigns, Hanoi, central Da Nang city and Ho Chi Minh City recently recorded higher helmet-wearing rates among children, reaching 68 percent in average from 38 percent in March, according to surveys from the Asia Injury Prevention (AIP) Foundations. The positive rate was revealed during a conference reviewing the outcomes of the National Child Helmet Action Plan on May 8. The initiative is part of Vietnam’s response to the 3rd Global Road Safety Week initiated by the United Nations. Khuat Viet Hung, Deputy Chairman of the National Traffic Safety Committee, said the results are attributable to sound collaboration between promotion activities and law enforcement nationwide. CEO of AIP Foundation Mirjam Sidik said the encouraging rate is a meaningful and practical response from Vietnam to the UN’s international week. At the function, participants discussed barriers to adequate safety precautions among young citizens – most of which result from low parental awareness on the matter.